In general, the Queen of wands in a reading meaning may depict a person of extreme focus and fiery passion. She is courageous and individualistic, though at times she may appear self-centered. They have a positive and an uplifting energy; they represent someone who is willing to be by your side and stand up for you. In terms of work, the Queen of wands signifies that you are planning to accomplish a significant amount of achievement in just a small amount of time. In the event that you are looking for a job, the appearance of this card may mean that a woman will play a major role in your career move. Generally speaking, in terms of your career, things are looking pretty good. 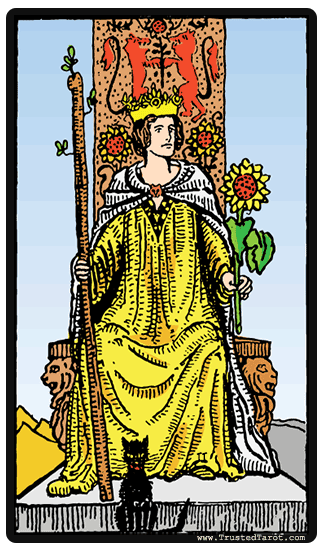 The Queen of Wands in questions of love also sends a positive energy. For people who are searching for love, there is a possibility that you will find it soon. When it comes to your finances, there is a chance that you are being carried away on spending a significant amount of money. We advise you to keep your expenses on check, or you will regret it in the end. In terms of health and spirituality, the Queen of Wands meaning may pertain to a spiritual hunger, a quest, or a search for meaning. Regardless of its position (upright or reversed) the Queen of Wands symbolizes fertility, and all the feelings, emotions, and aspects that it brings. It may mean that there is someone who needs your help right now. In terms of work, there is a probability that you will encounter obstacles that will hamper your progress. Do not mind these obstacles and continue doing your job as you see fit. To see this card may also be a reminder to adhere to your rational side - to balance your sometimes chaotic energy with clear though, and you will be more successful.